ULIS, a Sofradir Group company, designs and manufactures the widest range of thermal image sensors for commercial, defense and security applications. Established in 2002, ULIS has grown to become the world's second largest producer of thermal image sensors (microbolometers), exporting 97% of its products to camera makers across Europe, Asia and North America. Designed with state-of-the-art technologies, ULIS brand products range from low-resolution to megapixel military-grade thermal sensors. They are deployable in all-weather conditions and at night, offering users reliability, low power consumption, system compatibility and ease of integration. The company leads the field in introducing new industry standards in thermal image sensing for detecting threats, diagnosing heat loss, avoiding road obstacles, performing air-to air refueling, locating search and rescue victims and observing nature. ULIS is developing new assembly technologies that address trends in autonomous systems for smart buildings (workspace management, energy savings), road safety and in-cabin comfort of vehicles.  ULIS employs 230 staff and is located in Veurey-Voroize, near Grenoble.